The photographs remind us, repeatedly, that the racial delineations imposed by society are often arbitrary and flimsy, always fraught. The express ornaments of black culture that appear in some of [Genevieve] Gaignard’s images—braids and Afros, head wraps and African prints—like all surfaces, can be borrowed. The photographs remind us, repeatedly, that the racial delineations imposed by society are often arbitrary and flimsy, always fraught. Katie Ryder, “An Artist’s Costumed Alter Egos Cross Racial Lines,” The New Yorker, July 17, 2018. https://www.newyorker.com/culture/photo-booth/an-artists-costumed-alter-egos-cross-racial-lines. Comments Off on The photographs remind us, repeatedly, that the racial delineations imposed by society are often arbitrary and flimsy, always fraught. “I’m trying to show that blackness comes in many different shades,” [Genevieve] Gaignard explained to artnet News during a tour of her current exhibition, “Genevieve Gaignard: Counterfeit Currency,” her first in New York, at the FLAG Art Foundation. 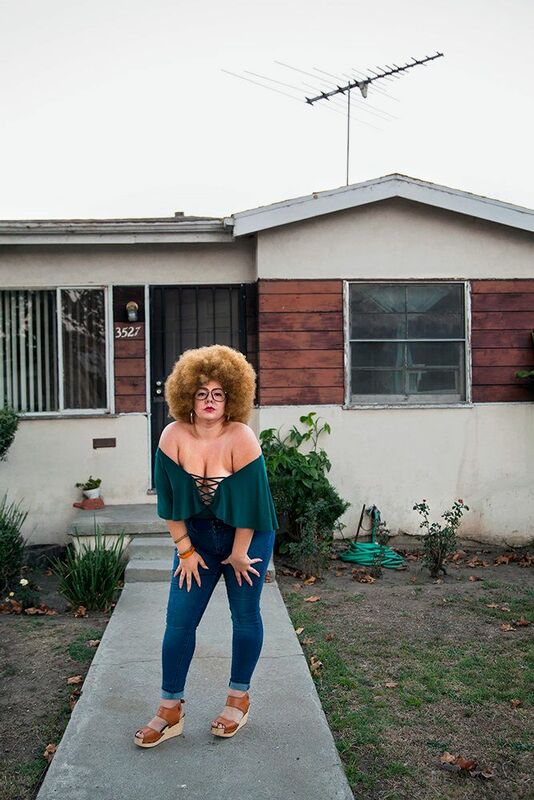 Sarah Cascone, “‘There’s Enough Damsels in Distress’: Artist Genevieve Gaignard Wants to Undermine Your Assumptions About Beauty and Blackness,” artnet News, August 3, 2018. https://news.artnet.com/exhibitions/genevieve-gaignard-counterfeit-currency-1327343. It’s complicated to reconcile with an appearance that conflicts with your identity, but art has been Gaignard’s outlet through which to come to terms with, explore and push the limitations of identity and its perception. Harriet Shepherd, “The Bi-Racial Artist Using White-Passing Characters to Talk About Blackness,” Sleek, June 7, 2018. http://www.sleek-mag.com/2018/06/07/genevieve-gaignard/. Comments Off on It’s complicated to reconcile with an appearance that conflicts with your identity, but art has been Gaignard’s outlet through which to come to terms with, explore and push the limitations of identity and its perception. 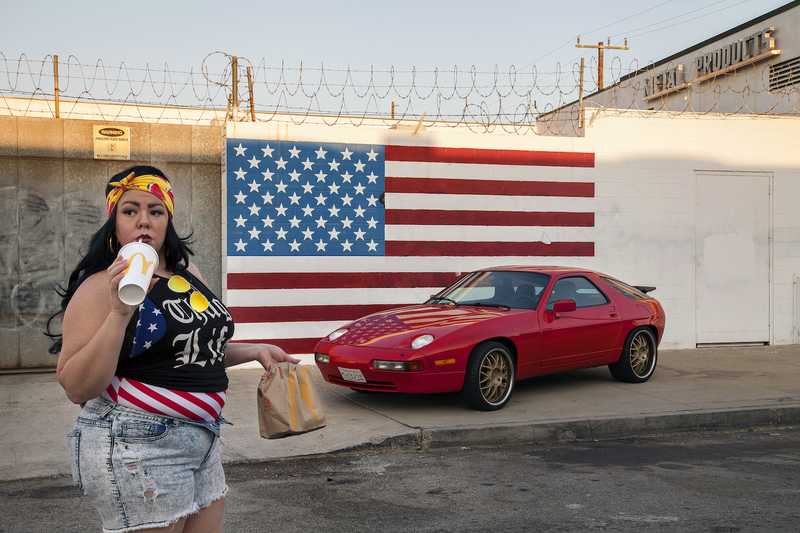 Genevieve Gaignard uses American stereotypes and comfortable settings to confront uncomfortable issues surrounding race and identity. American artist Genevieve Gaignard is a homebody. Not in the sense that she’s confined to the couch every Friday night, but rather that she’s infatuated with domestic spaces. “I’ve always had this fascination with what people surround themselves with in their homes,” she tells SLEEK. It’s a theme that’s been a constant in her work since she threw in the towel at cookery school and headed down a fine art path. From the panoramic interiors she lensed for her Yale application, to the carefully curated domestic installations that made up her solo show, Smell the Roses, at the Californian African American Museum earlier this year, to the household-centric creations currently on display at the Stephen Friedman Gallery in London — home is where Gaignard’s heart is. Artist Genevieve Gaignard grew up in the town of Orange, Massachusetts. Her mother was white, her father black ― one of the first black men to live in the small town. “I was always really aware that we were different,” Gaignard explained in an interview with The Huffington Post. Now 35 and living in Los Angeles, Gaignard has a strong sense of herself and her place in the world as a multidisciplinary artist. In “Smell the Roses,” the artist’s first museum show in Los Angeles, Gaignard tackles the big issues of race, class and, especially, identity.